This free email course will Give you one Detailed but quick instruction each day to simplify an area of your home. Make quick wins in organizing your home and setting up systems to maximize efficiency & minimize time spent on chores! Gain daily time and space that you can use for contemplation and reflection, wellness and self-care, quality time with others, or just peace & quiet. Feel less rushed and overwhelmed - and instead experience calm, rest, clarity and joy - because you're more in control and comfortable in your own home. The challenge was awesome! I learned a few new tips and re-implemented forgotten systems and now my home works for me and makes life easier." Thank you, Kelly, for the great tips and your commitment to help us live consciously. Don't have time to go through a course that gives you more time? Look, I get it. We all have a lot of responsibilities. But I want you to think about what's really important in moving your life forward in a way that's fulfilling and purposeful. Spending just 30 minutes a day for each of the next 7 days is not a lot given the huge benefits you'll receive. What if you stopped being a slave to your home? What if you felt less rushed and more present each day? What if you could find things when you needed them? What if you could reduce anxiety and frustration with your home? What if you had more time for the good stuff? I know it changed mine. When I simplified my life I not only gained time but also peace, confidence, serenity, productivity, and improved health. I had been living a busy life that wasn't intentional and wasn't aligned with my true values and mission. By simplifying and designing my goals, my days, and my spaces to support me, I was able to move my life forward in the right direction, and also enjoy the process along the way. BTW, in case you don't know me, I'm Kelly Anderson, your space and lifestyle design coach for the next 7 days. I'm a design coach, organizer and writer. This week I'll give you the steps that I used to simplify my home and habits, and I'll be challenging you to take just 30 minutes each day to implement action steps. You'll be breathing easier by this time next week! “My home seems to get out of control in the blink of an eye. 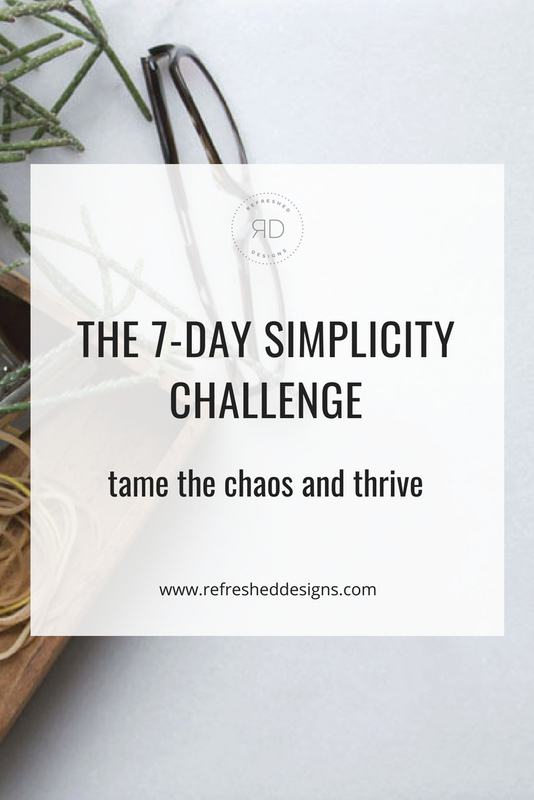 This challenge helped me get to get organized again, but it also made me rethink how I can keep it from getting chaotic again. I'm on the right track! I feel so much better now! This week of getting intentional with my home and the way I live in it was transformational. It's put me on the path to get serious about simplifying my home. Thank you so much for this coaching that I truly needed! A simpler life is only 7 days from right now. Important Note: by signing up for this free course, you are also giving your consent to be on my email list. Once the 7-day course is complete, I'll send an email once a week with more tips and ideas on simplifying home and life. But don't worry, if you don't want to remain on the list after the course, you'll be able to unsubscribe at any time.